How many of us have heard someone at a distance yelling at their dog? The loud commands that they might be yelling range from; NO! Come! Here! Sit! Get over here NOW! A two worded dog’s name combines into one, for example, John Wayne is now JohnWayne. This experience is one that all hunters with dogs or being on a hunt with dogs have likely had happen at some point in time. Or, maybe we were the one doing the yelling! One dog issue that happens dog owners frequently encounter is, “the chase.” What I mean here is, most of the time in the pheasant field the dog runs off after a pheasant. Or, if you miss a bird, your dog or your buddy’s dog will not come back as it continues to chase up other birds. This tends to happen with an untrained, young dog without any control. Certainly, if you have a trained, experienced dog you would not have that issue. From a whistle tweet, to a simple, “No bird,” it lets the dog know it’s not supposed to chase the bird anymore and come back. An experienced hunting dog will have minimal commands yelled at them because they just know what they are doing. For some breeds, like a pointer, it only takes a few tweets with a whistle to stay close, sit or whoa. This obviously makes the hunting experience much more productive and enjoyable. The less commands, the better the hunt is. A dog that knows the reason he or she is in the field is one that is easy to be around. One of the biggest mistakes I see out in the pheasant field are handlers trying to over handle their dog. If I see a dog establishing a hunt, I let them hunt. Sometimes the best command is no command. Keeping a good eye on the dog during the hunt will help keep you in control. You should use commands only when necessary. 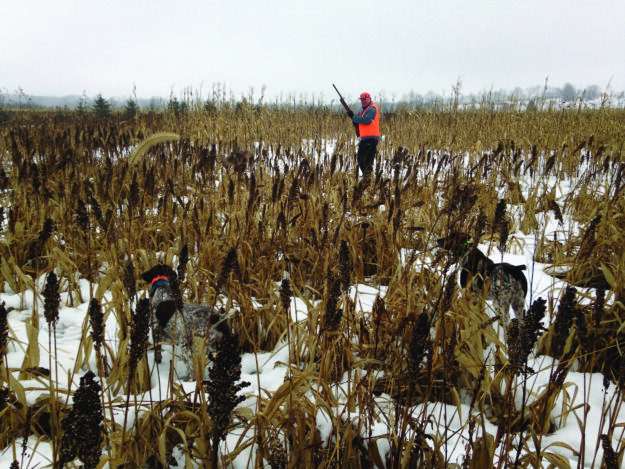 To insure a good hunt, train your dog with the help of a professional ahead of time. The E-collar can be a helpful training aid. If handled properly, which means the dog is collar conditioned ahead of time before it takes the field, problems can be avoided. I start the pup or young dog with it on their neck to get them used to it without using the actual electricity or vibration- some call it a stimulation or shock. After I feel comfortable about the dog knowing the obedience commands of sit, heel, and here, I may start to implement its use. I will use the E-collar at a low level to get the right reaction I need to get the dog to respond and respect the collar. Again, it is very important to use only commands the dog already knows, and use it as a reinforcement tool. The most important thing to do is put on the E-collar right away before he or she gets out of the truck, trailer, car, UTV, or whatever you are using to carry your friendly hunting buddy. If the dog is E-collar trained, you can use it on the dog if they do not respond to your commands. I will agree that it is important to have bonding time with your dog at a young age. The more time spent with your dog at a young age, the better the dog will be. 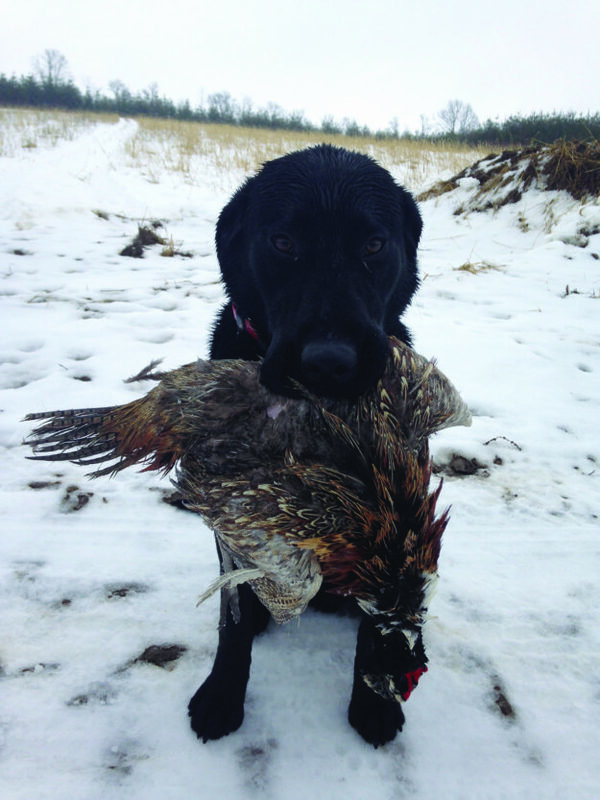 The bird training will help make your dog a better hunter. This is something to think about in the offseason. I start taking the dogs in at right around the age of 6 months or better. I train dogs year-round. I train other owner’s dogs to be better hunting companions. I typically get dogs in for what I think is a short time period of only 3 to 6 months. It really isn’t necessary to train for longer than that in most cases. The majority of the time it is the husband that will say, “I just want a hunting dog.” If you can look into the future, the benefits of having a well-trained dog in the long run is worth the time and investment for your family. I train the dogs on bird drive, obedience, force fetch collar conditioning and quartering the field. I use different drills and techniques to get that dog to become a better hunting dog for the client. It takes a lot of time, hard work, patience and repetition to become a good hunting dog. But in the end, a happy client makes it worth it. Let’s face it, if you hunt long enough, long shots are fun to see and spending time with friends, family and business acquaintances in the field. The indicator for me to have a great hunt is in the quality of dog I am working with. If it’s a loud hunt with a lot of yelling and hollering it’s probably not that fun. You must be patient with young dogs and continue to work hard with them to make them a great hunting dog. In the end, do the right steps for your hunting buddy and they will be the best they can be for you and you both will win!